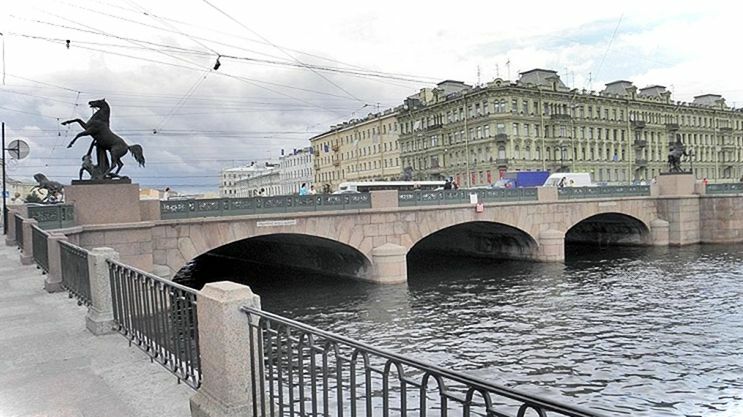 Anichkov Bridge is one of the first and most famous bridges in St. Petersburg. Of three ferries crossing Nevsky Prospekt, the bridge across the Fontanka River with its amazing horse sculptures is the most memorable. Now Anichkov Bridge has a length of almost 55 meters, its width is 37.9 meters and it consists of three spans. During the construction of Nevsky Avenue, there was a need to build a ferry crossing over the Erik River or as before the Fontanka was called - Nameless Yerik. "Behind the Big Neva on the Fantanny River, in perspective to build the bridge," Peter I ordered and in 1715 a wooden crossing was built. They called it the Anichkov Bridge - named after engineer-lieutenant-colonel Mikhail Anichkov, whose regiment was based in this place and built this crossing.Its length was more than 150 meters and covered the entire swampy floodplain of the river. Then it was the outskirts of St. Petersburg, and there was a border post, where passports were checked and fees were charged for entering the city. You could pay with money and cobbles, by which roads were paved. At night, the barrier was lowered and the guards sheltered in the hut, and later a guard house was built for them, where they checked documents and hid from the weather. In 1726, the ferry became a drawbridge and it was opened for the passage of ships with tall masts, and in order the wolves could not be able to enter the city, it was opened even at night. In 1749, according to the project of architect Semyon Volkov, a new wooden bridge was built.According to one version, it was specially strengthened to carry through it the elephants to Empress Elizabeth Petrovna as a gift from the Persian Shah of Iran. The ferry did not have a swinging passage and was sewed with boards decorated with granite. In the 1780s, seven similar stone bridges were built across the Fontanka River and the Anichkov Bridge was also rebuilt. It became granite, and the average wooden span was made a divorce, on the edges of the crossing towers with adjustable mechanisms were built. Of the seven crossings built at that time, only the Lomonosov Bridge and Staro-Kalinkin have survived, and it is possible to imagine what the Anichkov Bridge was at that time, it is possible by their appearance. Gradually Nevsky Avenue expanded and until 1840, its width had become much wider than the ferry through the Fontanka River, and the average wooden part had become unusable. Therefore, in 1841, the Anichkov Bridge was dismantled and a new crossing was built in the seven months in accordance with the design of the engineers Ivan Buttac and Alexander Raeder. Lieutenant-General Andrei Danilovich Gotman led the building. The grand opening of the Anichkov Bridge took place in January 1842. The towers were removed, and three spans were laid out with a brick and faced with granite. At the same time, cast-iron bars with the image of sea horses and mermaids appearedwhich were made according to the drawings of the German artist Karl Schinkel. Lattices with the same pattern are installed on the Palace Bridge in Berlin. Investigations in 1843 and 1847, 1855 and 1899 showed that the ferry has constructive disadvantagesand, as a result, is destroying. According to the project of architect Peter Shchusev in 1906-1908, repairs were carried out - the waterproofing of the constructions was made, and the brick vaults were shifted and lined with pink bricks. During the Great Patriotic War shells have damaged granite parapets and railings, and on one of the granite pedestals, and now you can see a dent from the projectile. In 2007-2008, the cracks of the coatings were removed, waterproofing, repair of arched brickwork and replacement of stone blocks were carried out. 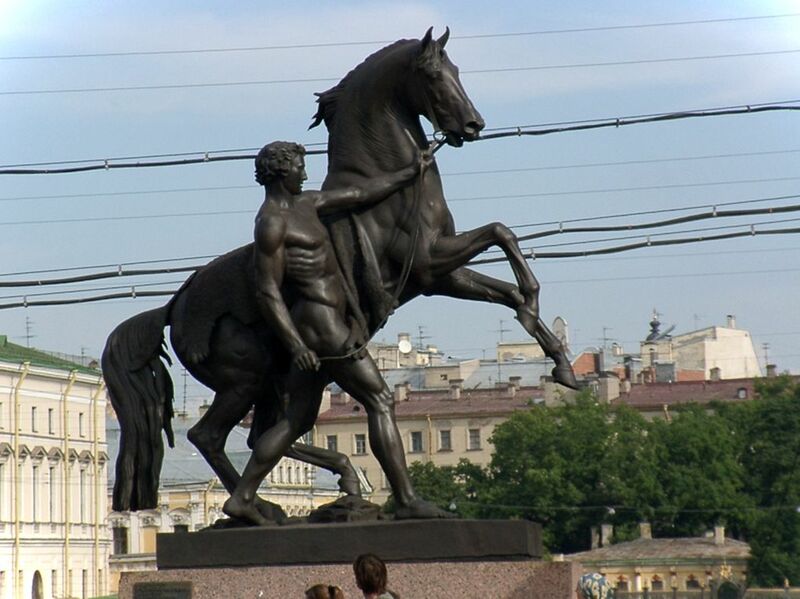 In 1841 the Petersburg sculptor Pyotr Karlovich Klodt worked on compositions of sculptures "The Horse with the Walking Youth" and "The Young Man Taking the Horse by the Feet", which had to be installed on the Neva Embankment opposite the Academy of Arts. 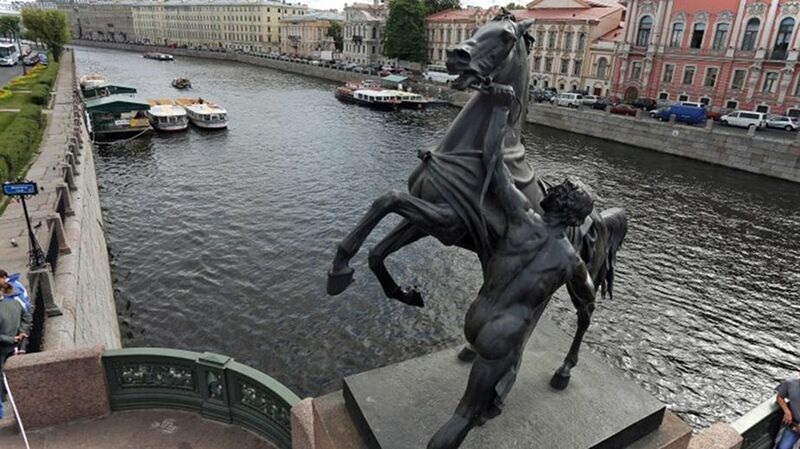 But after the decoration of the embankment with sphinxes, cast bronze sculptures were placed on the western side of Anichkov Bridge, closer to the Admiralty.And on the east side they were placed with temporary copies of gypsum, which it was planned to replace with bronze figures. Pyotr Klodt cast bronze sculptures, but almost ten years passed before the composition was completed. The horses were presented several times and they decorated one or another palace. The horses also became an ornament of the palace and park ensemble of Prince Alexei Fedorovich Orlov in Strelna. 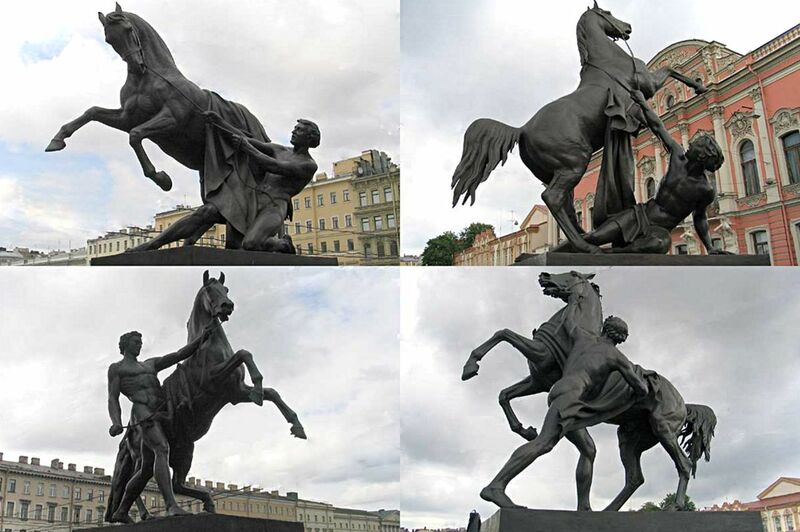 During the war, sculptures from the Orel park were abducted by fascists. In the Golitsyn estate in Kuzminsky Park, horses were installed at the Horse Court in front of the Music Pavilion and preserved until this time. The first group in the western part of the bridge is "The Horse with the Walking Youth". The animal is still obedient and the naked athlete holds back the bulging horse, taking him by the bridle. The adjacent group depicts the struggle - the legs of the horse are spread out and the head is upturned, the mouth is bared and the nostrils are inflated, and the young man with difficulty restrains the escaping animal. In the third group, located closer to the Beloselsky-Belozersky Palace, the driver was defeated to the ground and the horse has almost escaped. The head of the horse has been triumphantly raised and the young man with difficulty holds the animal with one left hand. And finally, in the fourth group, we see that the athlete conquers the horse. Having fallen on his knee, he squeezes the bridle with both hands and tames the animal. Pyotr Klodt with his composition glorifies the man who conquered nature. On one of the pedestals we see a bronze plaque with the inscription "Baron Peter Klodt molded and cast in 1841". During the Great Patriotic War, sculptures were buried in the park near the Anichkov Palace and were returned to the pedestals on the eve of May 1, 1945. 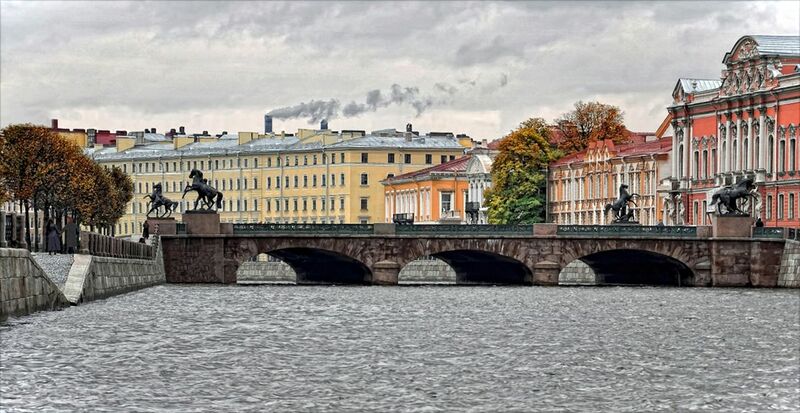 Once again they left the Anichkov Bridge during the restoration in 2001-2002 and were restored to the 300th anniversary of the Northern Capital. Although the name of the ferry came from the name of the engineer-colonel, Mikhail Anichkov, whose battalion was located nearby and built the Anichkov Bridge, many St. Petersburgers persistently want to connect this name with a tragic love story to some Anechka and attribute this romantic love to almost all the builders of the ferry. They say that in the 19th century a signboard with the inscription Anichkin Bridge was hung there and according to legend, this tragic love developed on this place.